What does a week at Beyond Trad look like? Rise, shine, stretch and sing! Start every morning off right with breath work, effective vocal warm-ups and some joyous singing all together! We will learn a few songs with the entire camp - a relaxed, inclusive and fun way to make music with the whole group! Some short daily announcements & Band Lab tune demos will sneak into this time as well. Home Room is the most in depth class of the week. They are various levels as indicated in their descriptions, or an all levels course if there is only one class for that instrument. You'll meet with your home room each day, working with the same teacher to build on skills from one class to the next. This group is open to all ages, instruments and levels. We'll set up a groove and add easy parts, taught by ear and layered, to make epic sounds out of simple pieces. Over the week we will be collaborating with the Camp Choir to create pieces that will include everyone at camp. Electives are short, one off workshops offered throughout the week. If you would like to attend, you just show up at the time and location indicated on your camp program (you'll receive a program when you check in on Monday). 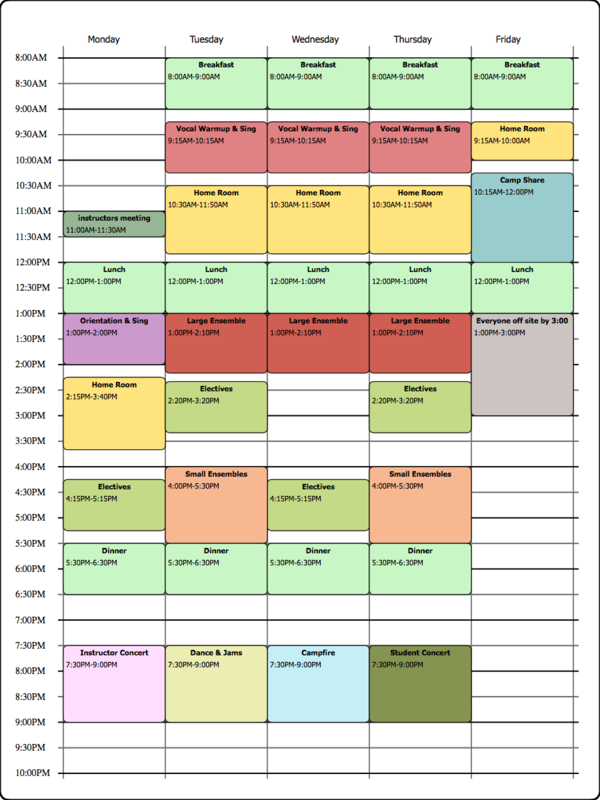 There is always a huge range of classes to pick from, the hardest part is picking just one! Simple, straightforward tunes, strongly facilitated. Sing and strum along in a friendly open environment. Participants will be divided into small combo groups, and given 45 minutes to put together a performance with the help of one of our Instructors. This is a great chance to practice performing, communication within a band and make new friends. Tuesday's Lab will feature selections from Folk and Bluegrass world, Thursday's will have selections from Western Swing and Country. Making music with just one other may seem simpler than a full band, but there are specific challenges to being in a duo. How do you get a full sound with just two instruments, and two voices that may have the same range, or quite different ranges? What are the best ways to arrange a song for an effective performance (key choice, harmony choice, intros, instrumental sections, repeats, etc)? We will delve into all these questions and more, using several classic duets, and duos, as examples (think Louvin Brothers, Dolly and Porter, Hazel and Alice). Challenges aside, we will also focus on the joys and rewards of singing and playing in a duo. You will gain some new skills and insights into what makes a successful duet sound! Join Trivo for a demonstration and talk exploring many global singing traditions. With a focus on how they use just three voices to create multiple textures and rhythms, imply harmony, blend, and build interesting and informed arrangements, you are sure to walk away inspired. At the end of the week the whole camp gathers together and each class gets to show the rest a little bit of what they learned. We then close the camp with the final performances of FolkHarmonic and Camp Choir (Large Ensembles) together. If you’ve even wondered how to fit in better in a jam or band situation, this course is for you. We’ll explore the value of simple textures and rhythms, when to fill and how to do effective melodic accompaniments that support and don’t get in the way. With a focus on bringing the best you can to any ensemble situation, this course is suitable for people playing chordal, melodic and percussion instruments. In this class we will explore a broad mix of genres such as celtic, eastern european and french canadian, and also try out different ways to accompany old favourites to make them our own! We'll have a look at rhythms for many kinds of tunes and turn your fiddle into a bodhran! Add in some adventurous arrangements, bowing techniqe and chording 101, and you've got a recipe for a great musical journey! ​Playing the fiddle gives you wings to travel the world. 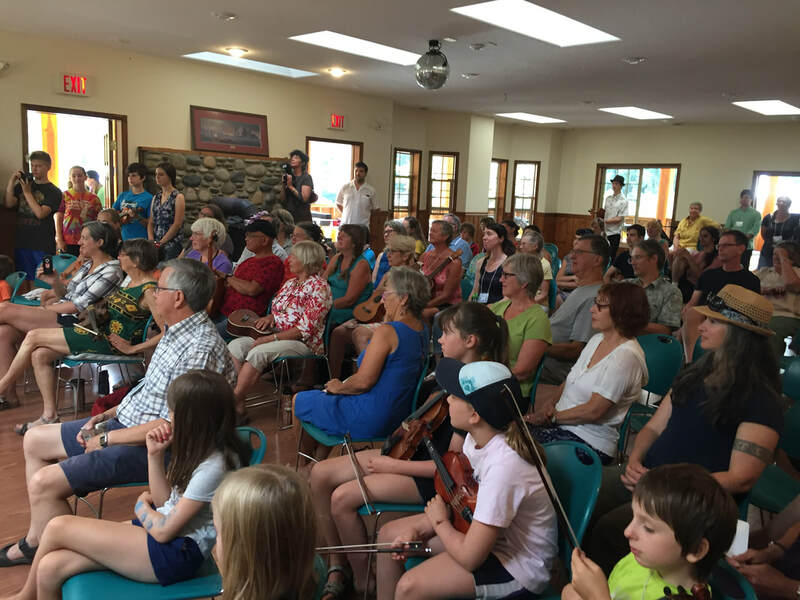 We’ll start with some down home fiddle tunes, learning foot rhythms in the French Canadian style to accompany them… then traveling farther afield to the east, to the Klezmer, Roma, and Slavic worlds. Along the way we’ll explore basic techniques to improve your tone, and using expressive devices to enhance your playing. Included will be the secret Romanian string trick. Intermediate tunes and skills are the focus here, designed to further your journey and take your playing to the next level. ​Advanced fiddlers need a strong repertoire of tunes, and a sound that conveys control as well as musical expression. In this class we will learn some fabulous advanced tunes which will help you in these areas, and challenge you to improve your overall sound. We will dig into right and left hand techniques from several styles that every advanced fiddler needs to know (cuts, rolls, slides, chopping, doublestops) and touch on some methods to improve your ear so you can backup other fiddlers with chords and harmony parts, and maybe even improvise a little. Whatever style you are into, having great sound requires a solid understanding of technique and the ability to really listen to yourself so you can start making the music you hear in your head. We will work on all of this and more to get you feeling confidant and relaxed as an advanced player. Learn how to learn the guitar using resources of recordings, technology and playing socially with other musicians. We will work on the basics of tuning, timing and tone while slowly building technique, muscle memory and knowledge. The repertoire of songs be familiar and will start with a one chord song, then build up the amount of chord changes. Let's look at some aspects that can bring your guitar playing the next level. We will review the nashville number system 1-4-5 and other common chord progressions so you can predict what will happen next while jamming a new song. I will show you some alternative voicings for chords that can be tasteful additions to your playing. We will look at different styles and groves of strumming and add some connecting notes between the chords. We will take a look at how to find melodies on your instrument. Then we can add the melodies to our rhythm playing in the Carter style technique. Bring a pick! Western swing rhythm guitar, as exemplified by the playing of Eldon Shamblin with Bob Wills’ band, combines a strong 2/4 pulse with a set of three and four note chords. This can be fairly simple, but also can utilize many different voicing of the same chord to achieve the bass line movement central to that style. We’ll learn a number of songs from the western swing world, and also look at how you can vary the accompaniment to add interest. For musicians ages 6-12 who have at least one year of playing experience on their instruments. This mini-folk orchestra & band lab will get the future's bright stars collaborating and playing together. There will be an emphasis on group skills, developing individual techniques, and communication. Fiddle, accordion, guitar, ukulele, cello, viola, bass, banjo & mandolin all welcome. (if your child plays something other than the listed instruments please email us at beyondtrad@gmail.com to confirm). This program also incorporates an art project and theatre elements. in this class we’ll have a big review (with a magnifying glass) of all the basics for your ukulele playing: Chords, chord changes, strumming patterns, strum and sing, practice tips, basic fingerpicking, and all the fundamentals that we learned at the beginning. If you want to get started, just got started not long ago or if you'd like a review of your overall technique, this class is for you. Brian’s famous class for singers or would-be singers is a safe and joyful space for you to explore your voice, expand your confidence and creativity, connect powerfully with your audience, and take any song and make it uniquely yours. Bring a memorized song of your choice. All levels are welcome to take part. ​In a fun, playful and supportive environment we will dig deep and explore the art of performance! This singer's lab is open to all levels and styles. Together we will learn some fantastic tools to enhance your solo chops, free your voice, build your confidence, inspire your musicality and refine your overall performance techniques. All participants must come prepared to sing one song and must bring a leadsheet/chart or sheet music in their key. *A note about Brian & Dawn's Home Room Classes. Both of these classes are Masterclasses. The word Masterclass refers to the format and style of teaching. By definition it means: a class taught by someone who has an expert knowledge or skill in a particular area, especially in music. At Beyond Trad ALL LEVELS of singers are welcome to attend, whether you are just finding your voice, or haven't stopped singing since you left the womb. Usually you are asked to prepare a song a head of time, the teacher then gives personalized feedback to each student. Both Brian and Dawn are exceptional at making these classes a safe and welcoming environment, allowing you the space necessary to be vulnerable and grow stronger as a musician and singer. ​Bluegrass Harmony is a language and process that enable three singers to create a full, lush, three-part sound. This workshop will give you solid fundamental tools for understanding and crafting your parts. What classical violinist doesn't have a secret fantasy of being a fiddler? Find out what it takes to convert, or better yet, do both well. Learn how to navigate some of the unique challenges you will encounter, such as learning by ear, understanding fiddle bowings, getting groove and style into your sound, jamming and improvising, and the violinists no-no: tapping your foot. The wonderful world of fiddle music awaits! ​We'll learn a popular traditional waltz on the violin that will have all the dramatic gusto a trueVenezuelan would ever want. These tunes are so fun to play, and we can make a spicy arrangement to go with it! Intermediate level. Prepping for your music for recording. This course will be in discussion format (ask lots of questions!) with some printed material covering the ideas presented in the class. Some of the topics covered: effective rehearsal for band members and guests, getting vocals harmonies tight, recording everyone together or separately, click tracks and more. As well, what happens during mixing and the role of editing in modern recording. Why is soul music so fantastic?! Why is soul music so fun to sing?! Together we will dive in and explore some of the techniques and styles of some of the greatest soul singers like Sam Cooke, Aretha Franklin, Stevie Wonder and Marvin Gaye. Using fun and inspiring songs, we’ll create a mini-choir in which budding soloists can seek, stretch out and soar! This session will look at techniques that enable one guitarist to take the place of a full band, with moving bass lines, varied rhythm feels and ”shots”. So… you just got a ukulele for yourself, huh? Then, this class is just for you. We will learn all the basics to start having fun with our new instrument. You will learn how to hold it, the name of the ukulele parts, the name of your playing fingers, the basics for strumming. How to read a chord diagram, how to follow a song chart, what is a tablature, to summarize… you’ll learn everything you’ll need to start this journey of joy and music with a ukulele. In this workshop we explore the music and style of Stephane Grappelli, the violinist who came to fame together with Django Reinhardt and the quintet of the hot club of France. He is considered one of the best jazz violinists ever and it’s very worthwhile to examine his playing as inspiration what ever your own style of playing. Most of his compositions were written together with Django with the exception of Picadilly Stomp, which we will learn in the workshop as well as some of the well known hot club tunes. We’ll look at his style of improv and how to incorporate it into our own playing. Absorb the genius of Stephane Grappelli! Bluegrass guitarist have been flatpicking melodies and fiddle tunes since the days of Clarence White and Doc Watson. Let's discover how to break down a groove into up and down pick strokes and look at some right and left hand techniques for smooth and even playing. I will show you some exercises to help you get comfortable with the skills and teach a fiddle tune adapted for the guitar. Let's pick! Level: Confident beginners and beyond. This is a unique opportunity to learn a traditional Mexican folk style from a native instructor. We will learn a selection of traditional ’sones’ on the ukulele, using the specific strumming patterns played in the 'Son Jarocho' music, in the plain lands of Veracruz. Detroit, Motor City, Hitsville, USA! The Temptations, The Supremes, Stevie Wonder, The Jackson 5…and the list goes on! Motown was a monumental musical empire that left the world with an unforgettable legacy. We’ll dig into the rich catalogue of this iconic sound and form our very own SongRoots Motown ensemble…Dust off those wingtips and fluff that chiffon! The inspiration to write a tune can come from the most unlikely places. In this workshop we will explore how to take an experience, idea or feeling and turn it into a tune. How do you get creative and let the notes, the key, and the mood of the music tell the story without words? As a group we will explore some methods for getting started, and then write a short tune, while getting familiar with the ins and outs of composing, dealing with roadblocks, while enjoying the process of creating your own original music. Picking every single note of a guitar lick is only one way to express yourself. When you add in hammer-ons, pull-offs and slides, you’ll discover a whole new world of expression that can add motion, style and speed to your playing. Printed materials will be available and there will be something for both beginners and intermediate players. Join vocalist and arranger Brian Tate for an all-guy session with men singing manly songs. We’ll cover elements such as call-and-response, vocal styles, soloing (optional) and singing harmony. We’ll sing a variety of well-known songs and we’ll sing them with strong, manly voices. If you are male and a singer, or have ever wanted to sing, come and join us. And bring beer. Lets spice up our rhythm playing with some fills. Whether backing up yourself or another singer, a pleasing musical arrangement includes some little note grouping at times between the vocal lines. In a full band this job is shared by all instruments taking turns and the guitar can do this as well when playing solo or in duets. We will work on the placing and sound of our G-run, walk-ups, cross-picking, musical lines and motifs. Patrice Haan and I will look at ways of getting two voices to work together, achieving a good blend while matching vowels and timing and figuring how to pick the right key and what vocal harmonies fit the style of the song. A lot of gatherings in Hawaii eventually evolve into a kanikapila, or loosely translated as a jam session, with friends and family singing and playing their favorite songs together. The brave instrumentalists take will take a pa’ani (solo) to break up the song while the stronger singers will lead the group as they kahea or call out the first word of the next verse. Join us as we jam through some Hawaiian classics and learn few tools to enhance your next kanikapila! Often when soloing, a person improvises over the entire chorus, yet one of most enjoyable ways to improvise is to trade solo’s with your musical friends over shorter sections of the song form. In this workshop we will learn how to trade one bar, 2 bar, 4 bar and 8 bar sections . Using simple melodies such as Duke Ellington’s C Jam blues, and the western swing classic, Take me back to Tulsa, we’ll learn how to keep track of the form of the tune while creating interesting improvisations. an introduction to the amazing world of electric fiddle! We'll take a look at the many ways to amplify a violin, try out special effects like reverb, distortion and doubling, and also check out looping! The accordion can function equally well as a melodic, rhythmic or chord instrument so there's lots of ways for it to fit into songs and instrumentals. This course will cover fills, a bit of blues, some idiomatic accordion styles and when to use "choppy" chords or long held ones. Turkey has produced a remarkable number of amazing violin players, most of whom are little known here in the west. In this workshop we will look a few melodies and some of the idiomatic approaches from this dynamic style of playing. Learn how to play in what might be considered the national time signature of 9/8and enhance your repertoire with the beautiful melodies from the ancient land of legends. Spend time with peers generating ideas and feedback for crafting original songs. Bring a song to share or look for ideas of how to bring one to completion. All levels welcome. The foundations of ear pleasing improvisation come from the answers to the basic question of any song or tune. What chord are we on? Which frets or notes sound "good" over this chord? What scale are we using (major, minor, or blues)? What are the notes or frets of the melody? What is our muse telling us to play? Do we want to use a lick from our bag of tricks? Let's look at how each of these foundations can be applied before putting it all together. Phrasing is what gives music its shape, sense, and groove, and there are many ways to choose how you shape what you sing. Singers of all levels are invited to come and learn simple and effective ways of phrasing in any style of music. Using well-known songs, everyone will have an opportunity to create some amazing phrasing! A guaranteed fun time. A Music theory introduction to demystify all those “complicated” concepts that might escape us, like: What is the meaning of the key signatures or what is a key, What are scales, What is the Circle of Fifths, Why does the piano have a black key between some keys and not others, etc. Bring Pen and paper, but mainly, lots and lots of curiosity. A good practice routine is essential to improving on your instrument (or voice), and in this workshop we will get into what that looks like. Good habits vs bad habits, how to arrange limited practice time for best results (should hard pieces be played first or last? ), how to set goals, and how to mark your progress, even when progress feels like it's not happening. Knowing how to practice well and how to understanding the results of your practice effort is not something we are often taught, so here is your chance to explore one of the most important responsibilities of being a musician.